At Corona Insights we are in the business of answering questions. 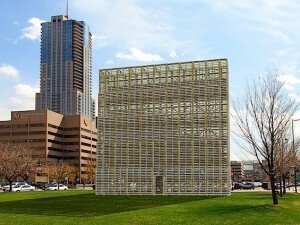 Recently, we had our own question: what is the wooden tower on Speer and Larimer? The only thing that could subdue the curiosity was a walk over to the … tower, billboard, construction project? As I approached the structure, it was clear I wasn’t the only curious person in Denver wondering about the purpose of this structure. Like a magnet, the Mine Pavilion attracts the passerby, engaging and inviting them instead. The tower has nothing to do with the construction across Speer on the Auraria campus. It is actually an exhibit that is apart of Denver’s Draft Urbanism, the Biennial of the Americas’ 2013 exhibition, that brings together the most engaging discourses in art, architecture, and film from across the America. If you don’t have time to walk down there yourself, you can learn more about the structure (and others around town) at Biennial of the Americas’ website. It really is a beautiful thing, check out the view from inside!